Laura and Graham love skiing and love the mountains. Both their families were very connected to Jackson Hole — a beautiful spot in Wyoming nestled in the valley of the Teton Range — and so they knew they wanted to have their wedding there. They also wanted to incorporate the famous landscape in their invitations. They loved the tea-length card because it's unusual and distinctive, and also because they knew the proportion would highlight the mountain range illustration. 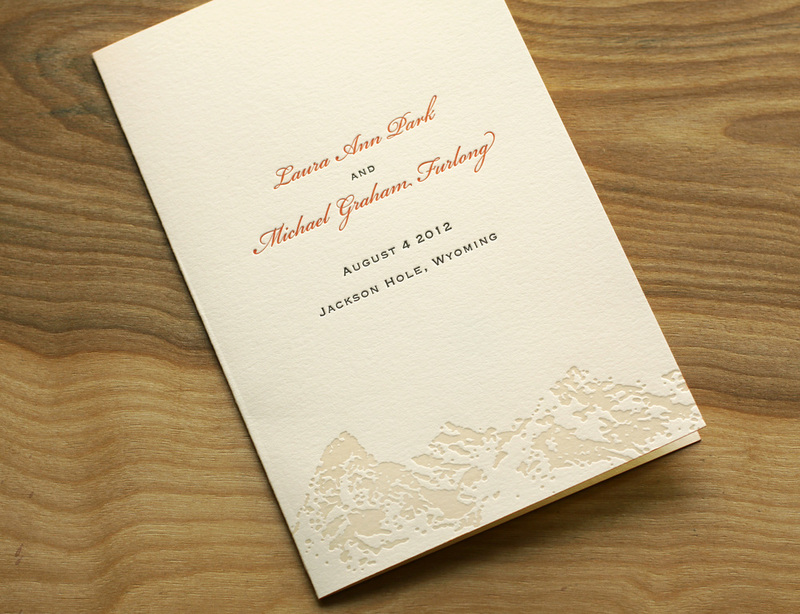 Travis worked with Laura to create the custom Teton art, and it was used on the invitation and on the program cover. Espresso and sherbet inks worked beautifully with the extra thick ecru paper, and corresponded with the wedding colors (brown was a featured color in the wedding, and the floral centerpieces had a pop of orange). The edges of the invitation card and the program cover were painted to tie together the sherbet accent ink used throughout. The set included a card inviting guests to the other events (a Friday night dinner and a Sunday brunch), and the RSVP card covered replies to these events as well as the wedding itself. It also had space to request a vegetarian menu and note lodging plans. Laura became familiar with Travis' studio while she was at business school in nearby Chapel Hill. She was amazed by his work, and said that "selecting who to do my invitations was the easiest part of planning." "Everyone loved the invitations," she said. "I got many compliments." Posted in wedding invitations and tagged with edge painting, ecru white, 600g, 300g, sherbet, espresso, program cover, tea-length, speckletone kraft. July 5, 2013 by Sarah Arneson.